Here we are poised to begin another new year. There is always much talk about resolutions and what we want to change about ourselves for the coming year. I have tried to make at least one resolution each year. That resolution is to contribute one important thing to the early childhood community. I hope to publish something in 2009 and hope that it will be helpful to teachers and caregivers. Here's to 2009 and everything we an accomplish between now and 2010. Good Luck. 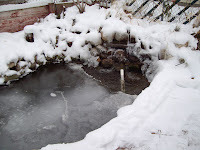 I was out breaking the ice on our pond (winter has arrived!) so that the turtles hibernating in the bottom will have oxygen. While breaking the ice I was thinking about the discussion that happens every year at this time about saying "Merry Christmas" or "Happy Holidays." It all boils down to validation. Human beings want to validated in their beliefs and cultural surroundings. I sometimes think that I should just say, "Merry Everybody and Everything." Actually, I think that is a good idea. As teachers we accept (or should accept) any child that crosses the threshold into our classroom. However, sometimes we adults forget to do that to each other. We are so busy trying to prove we are right, we think the only way to do so is to prove everyone else is wrong. I often think of Dr. Seuss's book, "The Sneetches," when it says..."that day they decided that Sneetches are Sneetches and no kind of Sneetch is the best on the beaches." Validation is the oxygen we need and I want to spend my time breaking the ice.